June 19, 2018 - No Comments! A few months ago we decided to give a try to Messenger chatbots. The plan was to craft an exclusive playbook for our subscribers and publish one chapter each week. It’s a playbook that includes all the means one can use to turn their website visitors into brand ambassadors for their product or service. 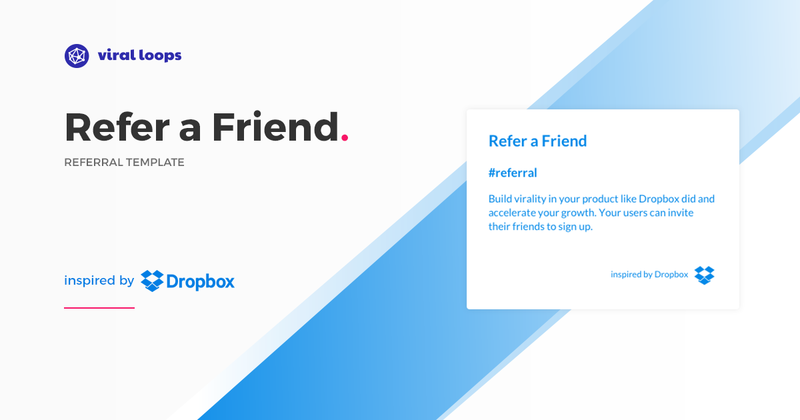 💪 What an Ambassador Referral Campaign is and how it works. You might have heard how Harry’s gathered 100,000 emails in one week before they launched. 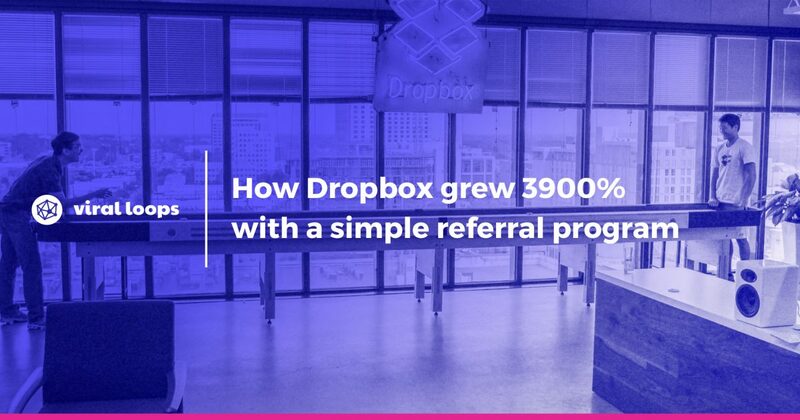 They used an ambassador referral campaign to achieve it and we show exactly how you can do it as well. This is the value proposition of the playbook. You will get a deep understanding of what it takes to succeed, and how to remove all the obstacles in the way. Landing pages are all about conversion rates, and we have the best recipe to create pages that convert like crazy; exactly the stuff you need for your ambassador referral campaign. 🏆 Choosing the best rewards for your ambassadors. It’s another thing to bribe people to talk about you, and a totally different thing to reward them for doing so. Inside the playbook, we are talking about how you can avoid falling into the trap of bribing people, and how you can choose rewards that express your real gratitude. 🔥 Boosting your campaign’s performance. 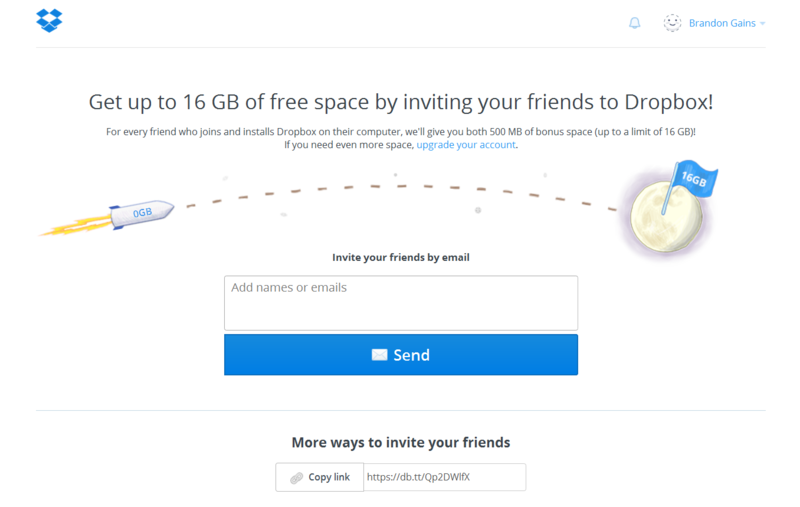 Just launching an ambassador referral campaign/ program doesn’t mean that there’s an autopilot. You might need to iterate in order to achieve pure greatness. We see ourselves as iteration maniacs, and after reading this playbook you’ll become one too. 💡 Technical growth hacks that can save the day. We give you some clever ways to use apps out there in order to blow people's minds away. These are testing and proven to work, so we explain how to do it yourself in minutes. Our Messenger bot worked pretty well and managed to gather a few thousands of subscribers very quickly. But this is not the reason I’m writing these lines. As we started adding chapter after chapter, we soon realized that the content we created deserves something better than just existing in a document on the cloud. So, we decided to make it an actual book. The playbook is live on Product Hunt, and we used its “Upcoming” feature to gather as many people as possible, prior to the actual launch. 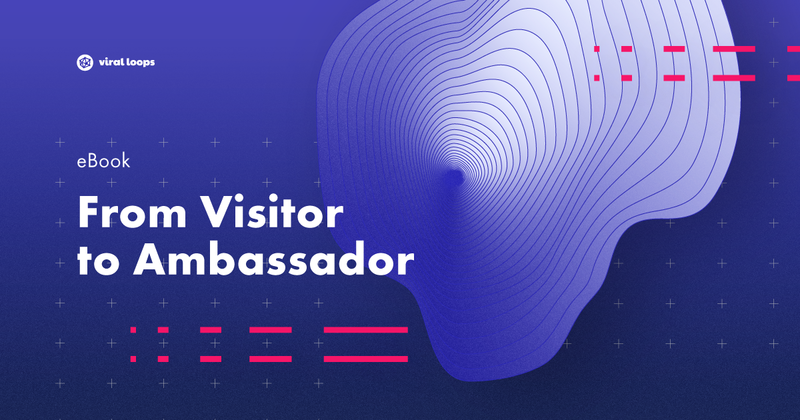 R U ready to Turn Visitors To Ambassadors? We're really proud of the outcome. We could sell it, instead of giving it for free. One of the most promising acquisition channels startups explore - or at least should explore - is virality. But what does virality mean? the tendency of an image, video, or piece of information to be circulated rapidly and widely from one Internet user to another; the quality or fact of being viral. Due to the explosion of digital marketing, marketers around the globe started using a new technique that allowed them to implement virality to products or services. Viral Marketing got born. Viral marketing is scalable. Even if you’re an early stage company, it can help you get high-quality customers with low acquisition costs. The difficult part you need to figure out, however, is how you can make your customers become your marketers. How one user brings others in. A lot of people believe that virality happens either by luck or magic. Others think that all you need is a crazy video. But this is not the case. PPAP (Pen Pineapple Apple Pen) is not what you’re looking for, and won’t get your business too far. Viral marketing should be the heart of your product. First things first. Virality is not Word Of Mouth. They are closely related and one reinforces the other. But they’re not the same. Word Of Mouth (WoM) happens when people love so much a product that they can’t stop talking about it. There are several ways of making people talk about your business. From offering them a great product and experience to giving them awesome support or asking them to pay $100 for a cheesesteak. When they notified us about it (I didn’t even expect that), they also included the exact reason of the issue as stated by their CTO. At that moment, I realized that these guys are truly honest. And their customer support is great. 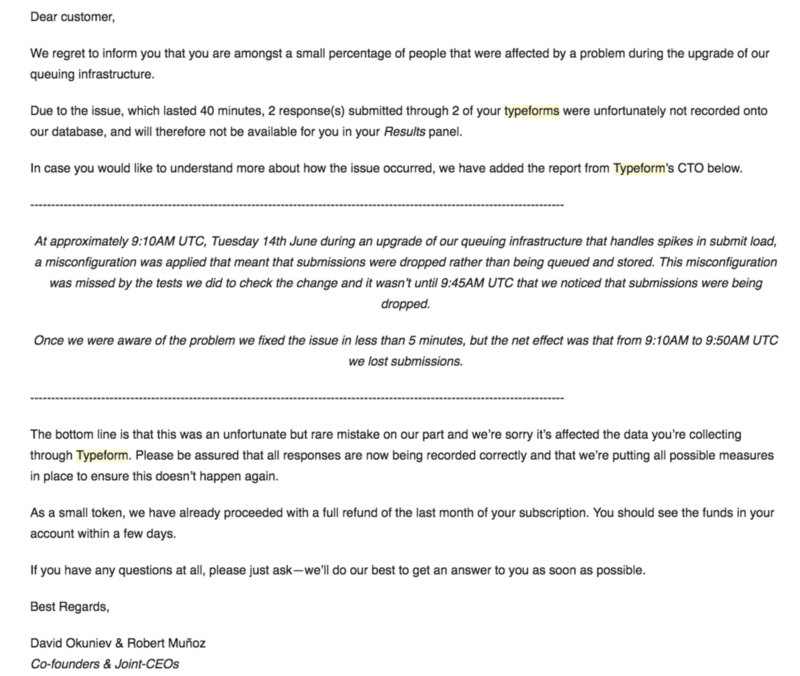 Their immediate action of letting us know about the issue without even noticing it, as well as their transparency, made us love Typeform even more. Not just because it is a great product, but also because their team treated us so special. 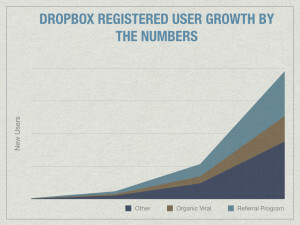 Virality, on the other hand, happens when people spread the word about a product or service in the context of using it. When I invite someone to talk over Skype, it doesn’t mean I love it. But if I don’t have someone on Skype, I won’t be able to use it at all. When virality is inherent to a product, the existing users gain value out of taking an action which, in turn, exposes the underlying platform to new users. 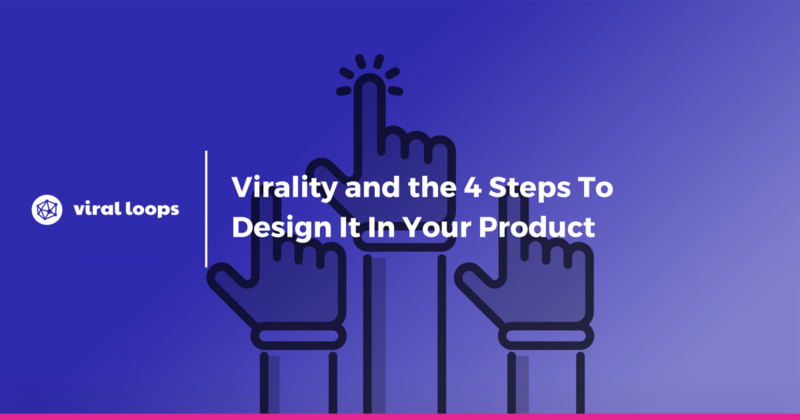 So, how can you design your product for viral growth? Let me show you how we designed and engineered it into our own product. 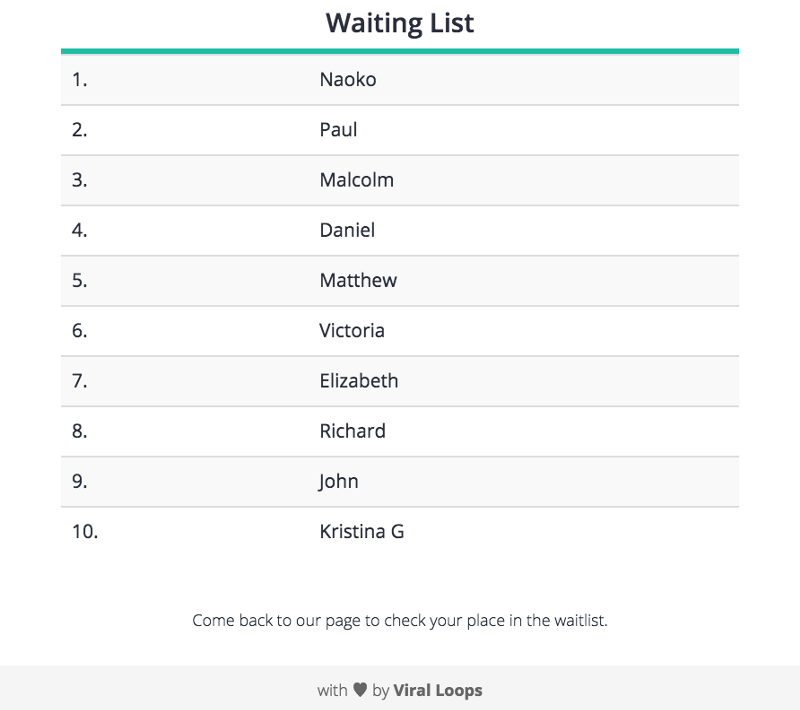 Viral Loops is an all-in-one viral and referral marketing platform helping startups, professional bloggers and eCommerce stores acquire more customers and increase their revenues through referral programs, giveaways, sweepstakes and prelaunch campaigns. The first thing we did was to understand the type of virality that could help our product grow while taking into account that we’re a B2B SaaS platform and not Snapchat. Pull Product Virality (PPV): Product virality where existing users require people in their network to join to gain value out of a feature. 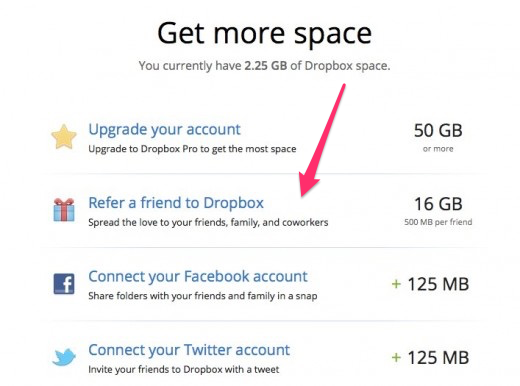 Think of Dropbox, Slack and Facebook. You need to have your friends or colleagues in there, else you just can’t use it. Distribution Product Virality (DPV): Product virality where existing users spread awareness of a product to their network. Instagram has leveraged DPV extremely well. The time people post their photos on Instagram, they also share them on Facebook because of social currency. Josh Elman also explains the different types of virality in one of his latest articles, at Greylock Perspectives. In our case, we chose to start with DPV, as a marketer or blogger can use our platform without needing to have others in the same network. 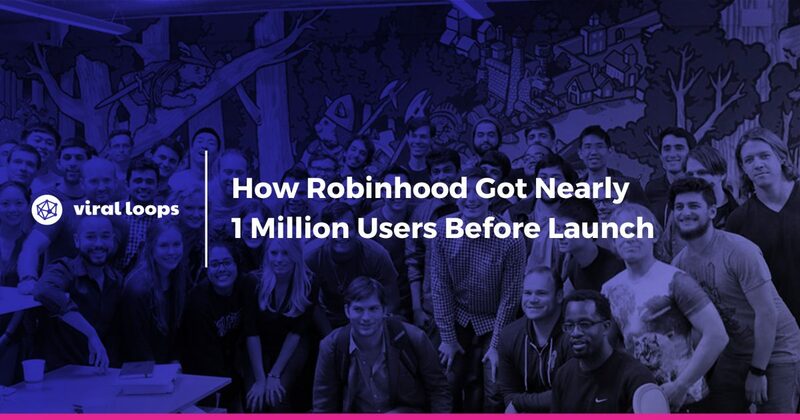 From the very first time, we knew that virality would be one of our main traction channels. Not only because it is a great channel, but also because if we can’t make it work for our own company, how will our customers? 1. Why will the sender send units out of the platform? This is about finding the right sender incentives. Our customers use our product to run their campaigns. So, inevitably they want to spread the word about their campaigns as much as they can. This way, they also spread the word about us. This behavior is similar to when someone creates a Kickstarter campaign. When (s)he promotes his campaign, (s)he also promotes Kickstarter because this is the platform the campaign runs on. 2. What is the minimum transferable unit on the platform that can move on an external network? At this point, we needed to come up with our spreadable unit. We took advantage of the classic marketing tactic “Powered by.” This is used by a lot of platforms out there, including Intercom, Eventbrite, and many others. Our spreadable units are our widgets and emails. We chose the “with ❤ by Viral Loops.” So, we use this badge everywhere. This brings more eyeballs to Viral Loops. It also made us change our roadmap and come up with more widgets that will help our customers acquire more participants for their campaigns while increasing the virality of our product. 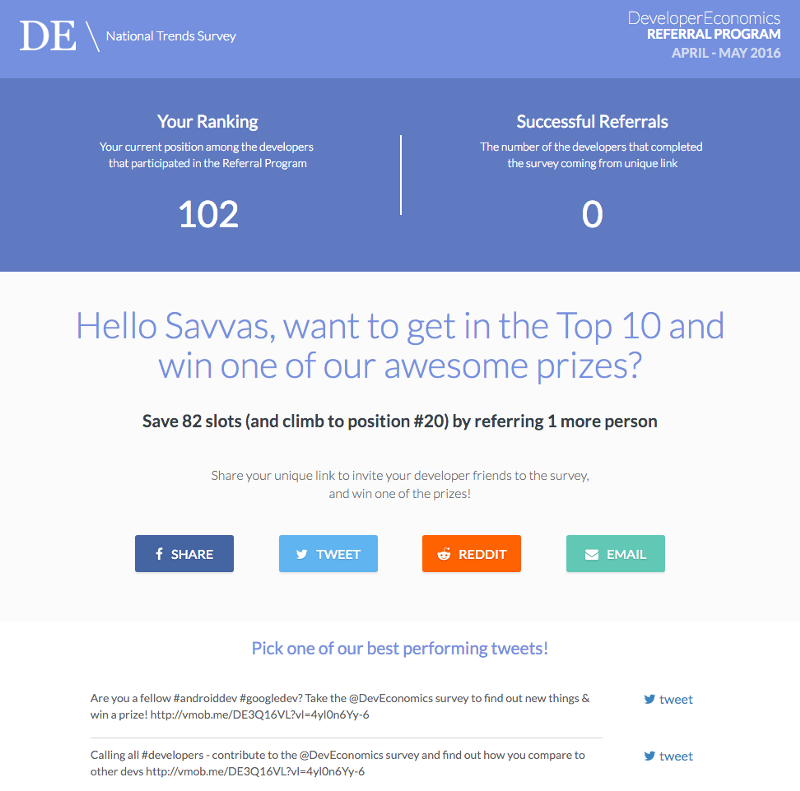 For example, we built a public embeddable leaderboard so our customers can put it on their main website in order to show off their advocates and engage them more. 3. Where will the unit of the platform meet non-users? And now our external network. Our customers share their campaign through several distribution channels they use for their marketing activities. So, by sharing the campaign, they share Viral Loops, too. 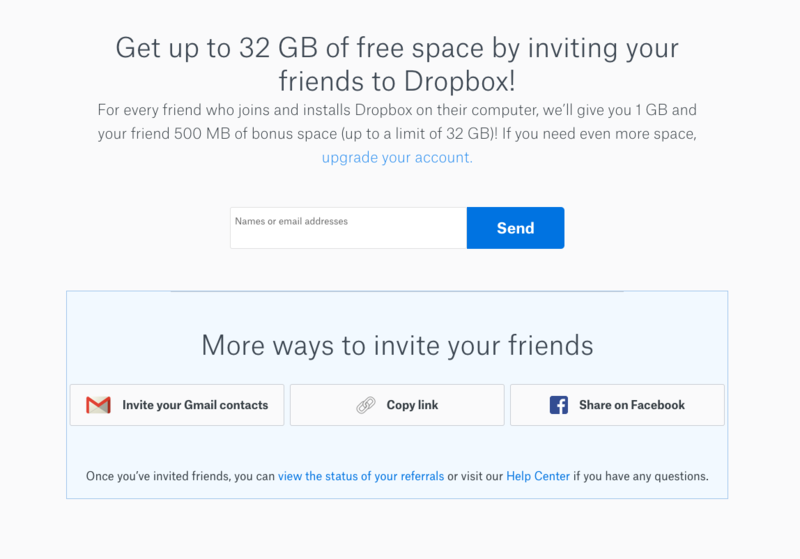 On top of that, the participants of the campaigns (the customers of our customers) invite their friends through the sharing options we offer, including Facebook, Messenger, Twitter, Email, and others. 4. Why will a non-user on an external network convert to a user on the platform? For the last question, we needed to think of the recipient incentives. Build features so our customers can acquire more users and run very successful campaigns. Provide a stellar experience for the participants of the campaign through our widgets and the whole campaign setup. 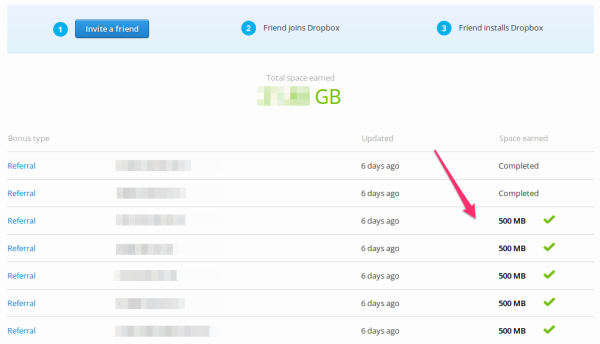 This way if one of our target customers participates in a campaign of our users (e.g. a marketer or startup founder) and the experience is unique, then he will be curious to see how this campaign is built. And then, our tiny “ with ❤ by Viral Loops” will lead him to us! The Invitation Click Through Rate.